The IDEF methodology was originally used in manufacturing and systems engineering. IDEF0 methods are intended to model the functions of a process, creating a graphical model that displays: what controls the function, who makes it, what resources are used and how it is related to other functions. Soon the IDEF methods have been adapted for wider use and for software development using Agile methodology. In software development process the IDEF0 tool is used to model the decisions, actions, and activities of a software system. It contains the necessary notations to support software development. ConceptDraw DIAGRAM is powerful and easy to use IDEF0 diagramming software. ConceptDraw DIAGRAM allows you to support a software development process with professional IDEF0 diagrams using the IDFE0 notation supplied by the IDEF0 solution from the Software Development area of the ConceptDraw Solutions. Open a ConceptDraw DIAGRAM new document and select the IDEF0 diagrams library. An IDEF model is made up of several diagrams. Each diagram describes in more detail a box from a more general diagram. It be started with the Diagram Box element. Fill a title at the bottom of the diagram to provide a node name, title, and diagram number. Add boxes that represent functions such as activities, actions, processes or operations by dragging them from the library into the Diagram Box. Use the IDEF0 connector library objects to join boxes. Drag a connector objects onto the drawing page and move their endpoints to connection points on the boxes. Next, add text that describes the box or connector: select it, and then type. To make changes in IDEF0 objects use the Action button menu. To open the menu select an object and click the button in the upper right corner of the object. You can quickly ang easily customize your diagram using the set of embedded styles provided in the Format panel. Result: IDEF0 diagram can be used to create graphical representations of a model of a desired version of the application. 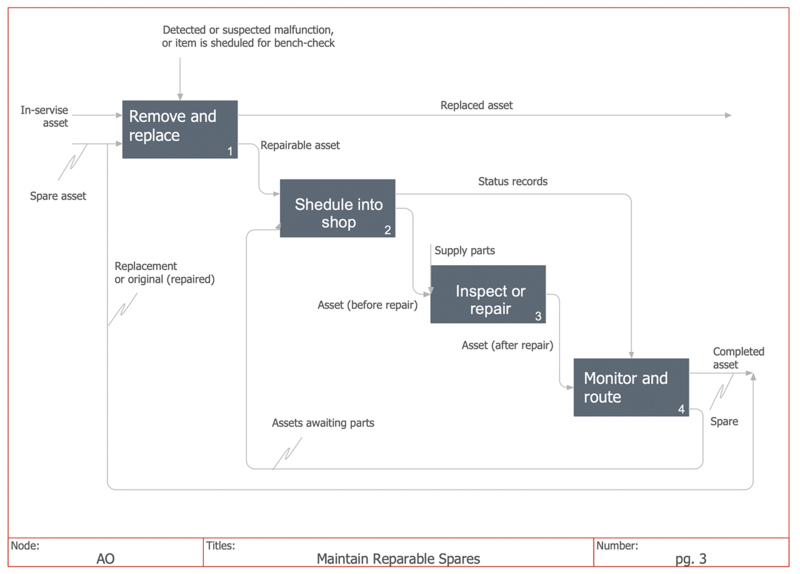 ConceptDraw DIAGRAM allows you to create and communicate the IDEF0 diagrams of any complexity.